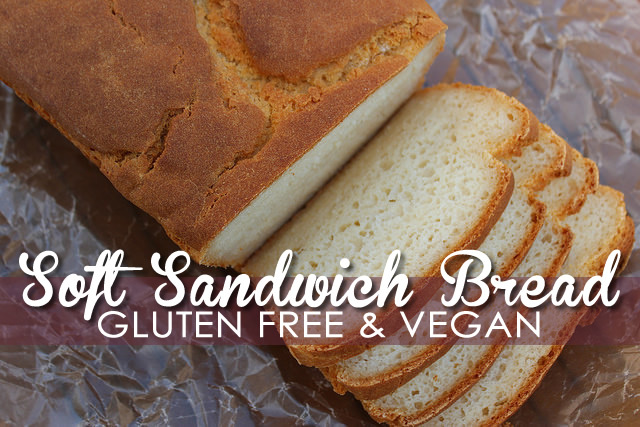 Soft Gluten Free Vegan Bread Recipe - Easy & Delicious! 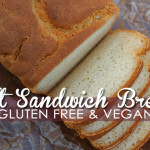 A couple of years ago, I posted a Soft Gluten Free Sandwich Bread Recipe that still gets a lot of attention. I hear from hundreds of people every month who love it & at least as many begging me to create a Vegan (egg free) version of it. It wasn’t until we discovered my son was also allergic to eggs that I started taking the Egg Free options very seriously. 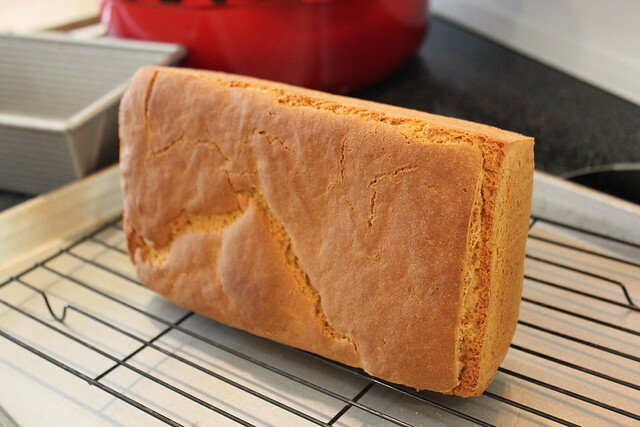 Aside from the added step of whipping the chickpea liquid to stiff peaks, this recipe is very similar to my other Gluten Free Bread Recipe with a couple of important tweaks… it’s important to follow the instructions carefully. I can’t say at this point how your substitutions will work. 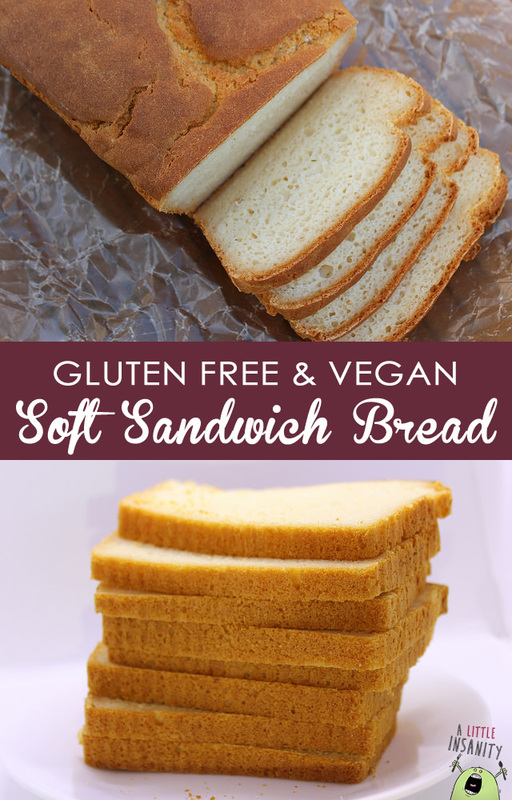 The BEST Soft Gluten Free Vegan Sandwich Bread Recipe – Featuring Aquafaba (Garbanzo Bean Liquid) Whip as an Egg Substitution. ¼ Cup Aquafaba – Brine/Liquid drained from canned Garbanzo Beans (aka Chickpeas) – Use up those Garbanzo Beans in Homemade Hummus, Roasted Chickpeas or 3 Bean Salad! In a measuring cup, measure out warm water (should be warm to the touch, not hot or cold). Stir in Honey and add Yeast last. Set-aside & let proof for approx. 10 minutes. 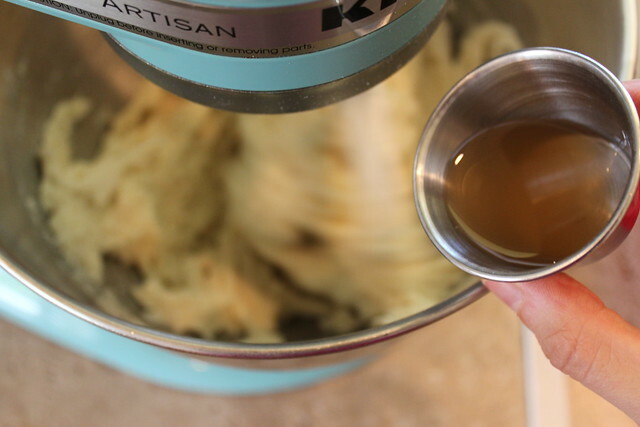 While Yeast is proofing, pour the Aquafaba (Garbanzo Bean Liquid) along with the Cream of Tartar into the clean & dry bowl of your stand mixer fitted with the whisk attachment. Whisk on high until stiff peaks form. On my mixer, soft peaks happen around 2-3 minutes & stiff peaks around 4-5 minutes. Once you have stiff peaks, use a spatula to scoop out the fluff and set-aside. 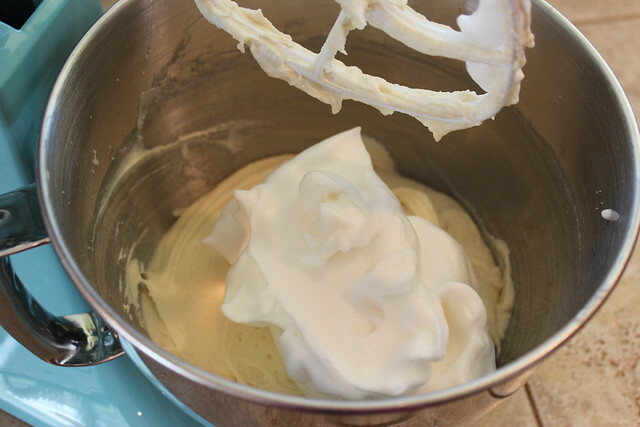 While the Aquafaba is Whisking, Combine all of the Dry Mix ingredients together in small bowl. Add in the proofed Yeast Mix to the stand mixer bowl. 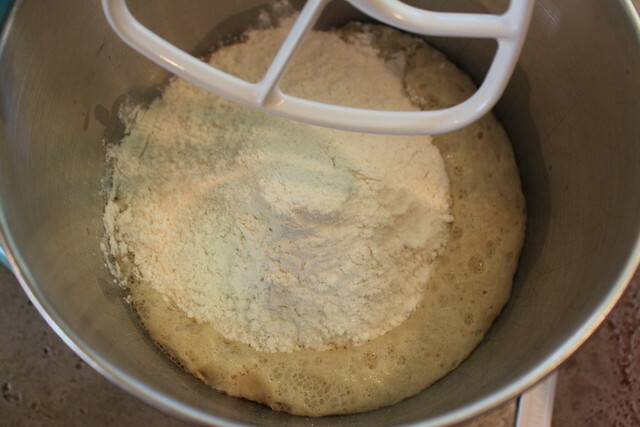 Add Dry Mix ingredients in mixer bowl with yeast. Using the paddle attachment, begin to slowly mix while adding in the Oil, then Apple Cider Vinegar. 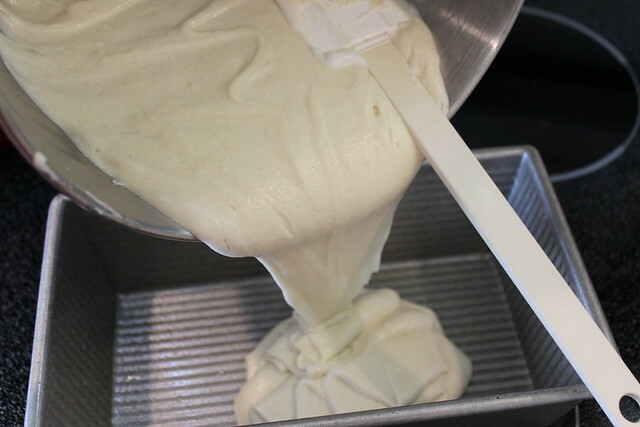 Mix well on Medium-High for 2-3 minutes until dough is smooth, but wet & sticky. Mix gently on low speed until dough is well combined (approx 30 seconds or less)… Do not over beat. 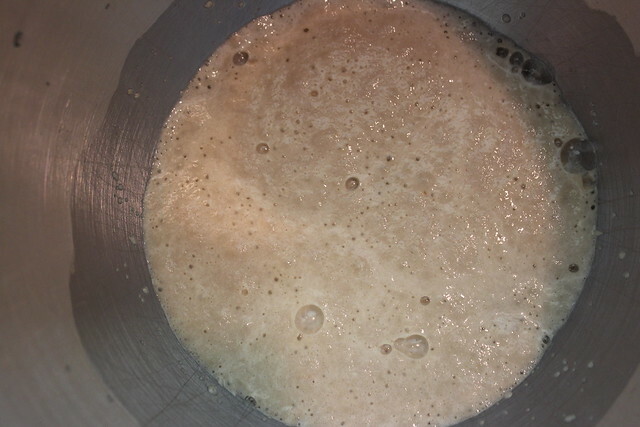 Mixture will be thick yet somewhat runny (think cake batter). 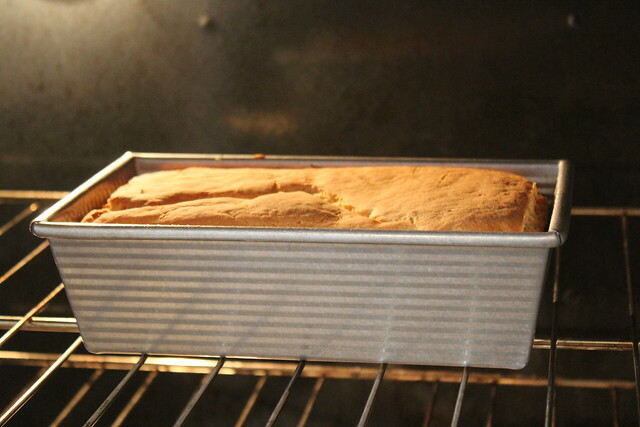 Spray or Grease your 9×5 Loaf Pan. 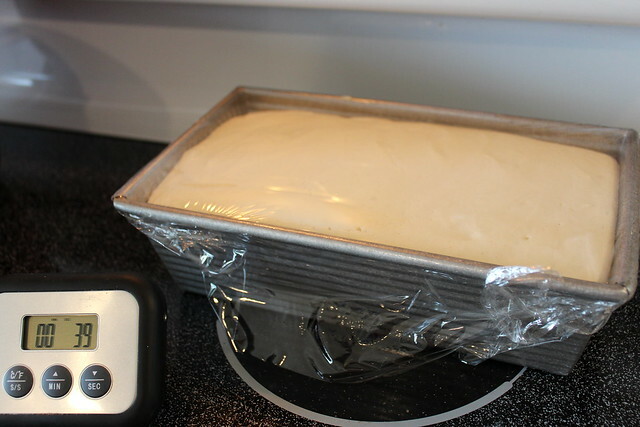 Using a spatula, scrape the bread mixture into your prepared loaf pan and Cover with plastic wrap. Set pan on top of your warm stove to proof while the oven is preheating. It is important not to over-proof the bread – just let it rise approx. 20-30 minutes (depending on your room temperature). 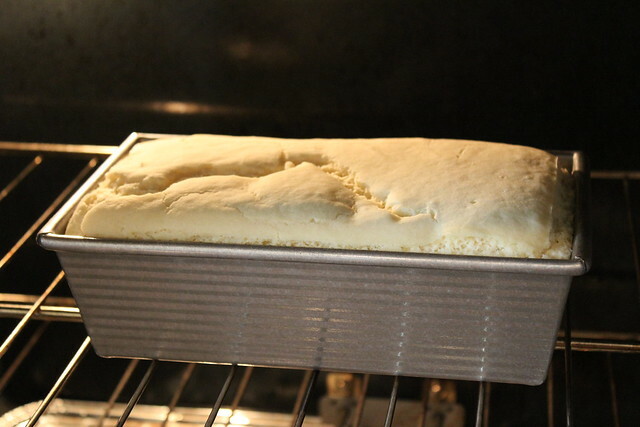 Don’t let it rise above your loaf pan… Gluten free breads do not maintain their structure and will flow over the pan or collapse if left to over-rise or over-filled. Bake for approx. 50-60 minutes. If the crust is darkening too quickly, you can cover it with foil (tent open ended) and return to baking until done. (If it helps, I usually cook mine until I get an internal temperature of 210 – 220 degrees on my digital thermometer). 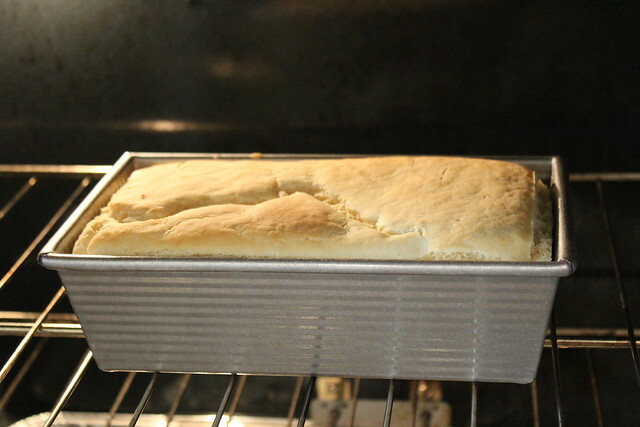 Loaf may initially rise much larger than the pan, and shrink back a bit… that’s ok, just be sure it is completely cooked before removing from the oven. 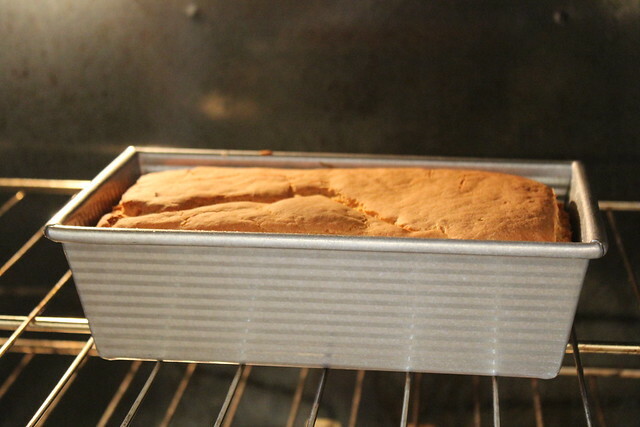 Remove loaf pan from oven and let cool for 1-2 minutes before turning out onto your cooling rack. 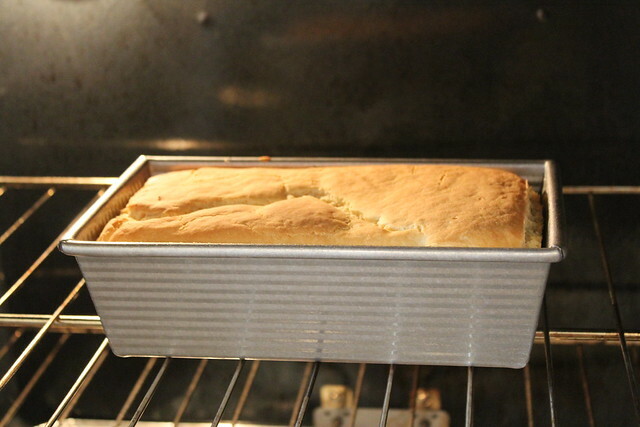 (I always cool my loaves on their sides to keep the steam/moisture from making the bottom dense). Allow to cool completely before attempting to cut into slices. Loaf keeps best for 1-2 days out on counter in airtight container or bag, but I’ve found that the loaf stays moist even when placed in the fridge. 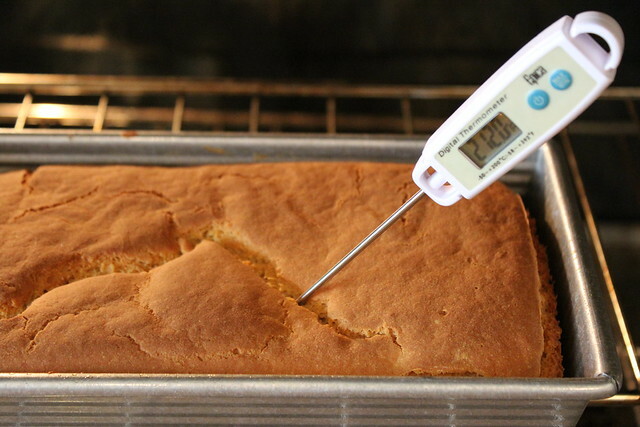 Without eggs, there will be a little bit of shrinkage – this is typical with gluten free baked goods. You will notice with this recipe that the loaf will rise in the oven during the first 20 minutes, then gradually come back down to the same size as when you put it in after proofing – this is normal, and won’t affect your loaf. The key to remember with Gluten Free baking is NOT to overproof OR NOT to leave the loaf in the pan more than a minute or two after pulling it out of the oven – both of these can result in the loaf sinking and becoming dense at the bottom. 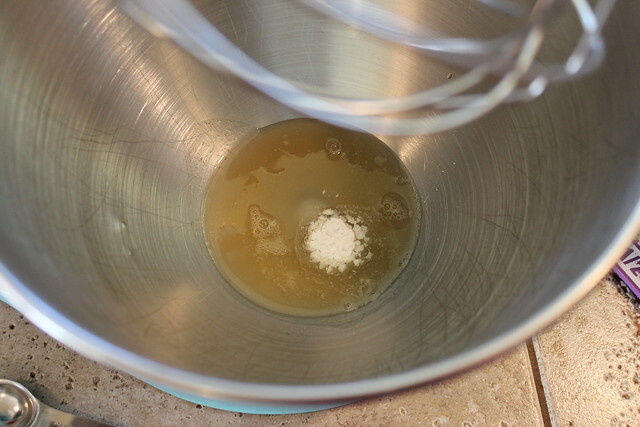 Proof your yeast – If you don’t have two separate Stand Mixer bowls, then do this in a large measuring cup. While your yeast is proofing, combine your Chickpea/Garbanzo Brine with Cream of Tartar & whisk in stand mixer bowl on high. 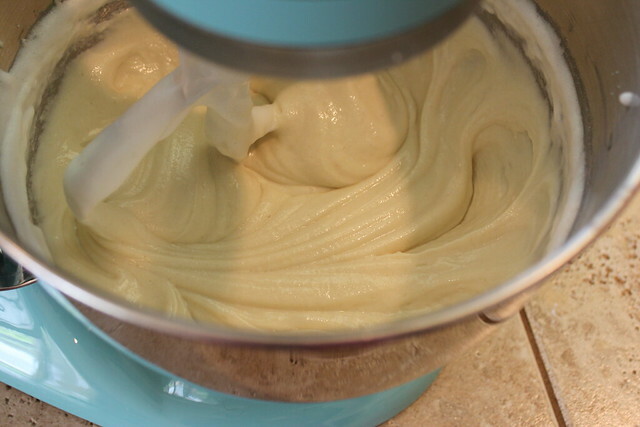 Mix on high until stiff peaks form (approximately 4-5 minutes when using a stand mixer). Set this aside for use later. 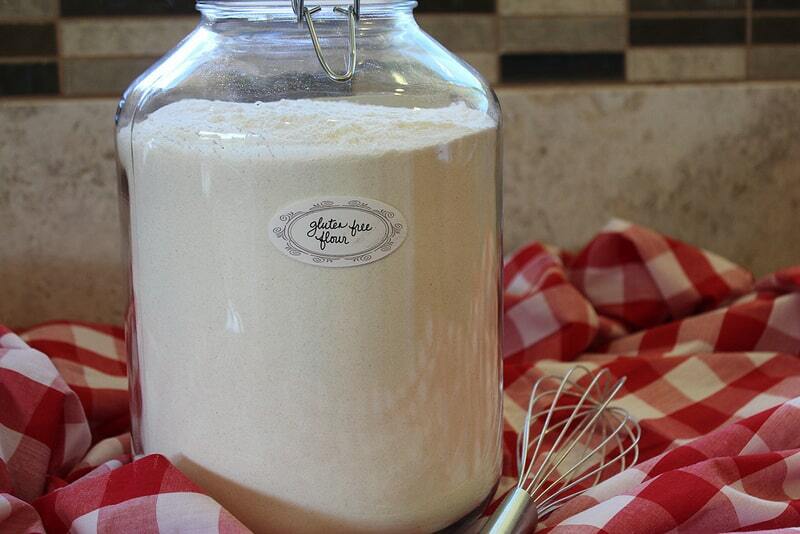 Whisk all of your dry ingredients together and add to your stand mixer bowl with the fully proofed yeast. (Don’t add the Garbanzo Brine Whip yet.) 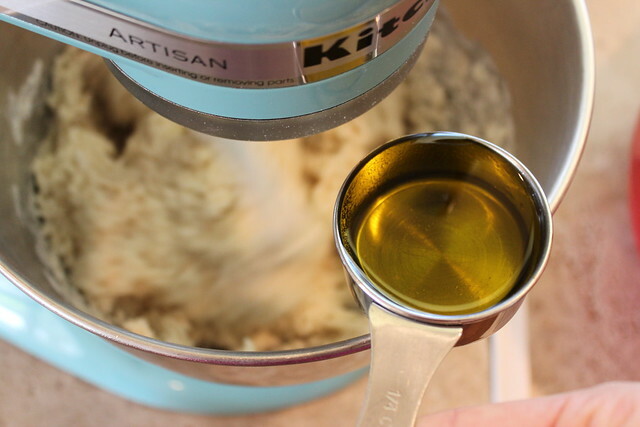 With paddle attachment, mix dry ingredients with yeast until wet, and with machine running on low, drizzle in Olive Oil. After adding the oil, drizzle in your Apple Cider Vinegar – then Beat mixture on High Setting for 2 minutes. After mixing for 2 minutes, stop mixer and scrape in your garbanzo bean liquid whip (stiff peaks). Turn mixer back on and mix at low speed until mixture is well incorporated (maybe 20 seconds or so) – But, do not over mix! Pour bread mixture into your prepared loaf pan. See how the mixture is thick, but loose. 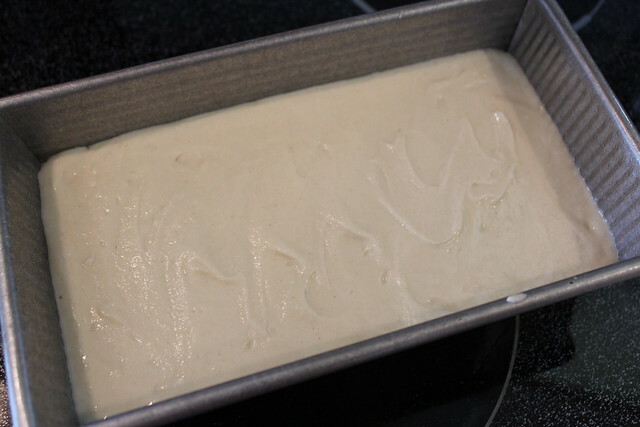 It’s more like cake batter – it will be nothing like regular bread dough. Smooth top of loaf and cover with plastic wrap. I place mine on my stovetop while the oven is pre-heating to 375 Degrees Fahrenheit. In my warm tropical climate, the loaf fully proofs in approx. 20-25 minutes. But whatever you do, please do not overproof your loaf – it will fall after baking. I just proof it until it almost touches the plastic wrap… Take note, that this will be the finished size of the loaf after it bakes – even if it rises in the oven. Here’s what it looks like after 10 minutes in the oven… see the little bit of rise? After 20 minutes in the oven – see how it shrinks back a bit? After 30 minutes in the oven. After 40 minutes in the oven… See how it’s back down to the size it was when you placed it in the oven after proofing? After 50 minutes in the oven. After approx. 60 minutes in the oven… The crust is nice and brown, and the temp just right at 212 degrees. Once I pull it out of the oven, I like to cool the loaf on it’s side to avoid steam moisture making the bottom dense. It may be just me, but I think it cools faster this way too! =) Let the loaf cool completely before slicing – Seriously, you will ruin the loaf if you don’t wait – I know this because I’ve been impatient many times – oopsie! ;) Check out those beautiful slices! « Blended Vegan Mocha Recipe – No Coffee or Sugar! My question is about the garbonzo bean brine. You use canned beans, my son’s Dr. Strictly forbids all canned foods from his diet. Is there a way to make this from dried beans? Thank you for any help you can provide. You are amazing! Thank you so much for this! 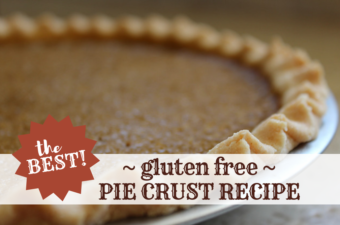 I love your all purpose gluten free flour mix so I cannot wait it to try this! Hey.. Honey isn’t vegan so what can we use instead of that? Thanks so much! I appreciate all you are doing to share your recipes and solutions to food allergies / intolerances with others. Your gluten free vegan bread has been a HUGE hit at our house with my son being recently diagnosed with allergies to gluten, egg and dairy. I’m not much of a cook / baker, but have had to learn and your website / recipes have been exactly what I was looking for in a bread. And with that one solved, I am on to other recipes that can help me replace our older / wheat based zucchini breads. Thanks again! Is it possible to freeze the loaves? My son recently went on a gluten, dairy & egg free diet. We are still learning substitutions for his favorite foods. My next challenge will be baking and I’d like to give this recipe a try. I know it would take awhile for him to finish off a loaf so it would be best if we could just take what we need from the freezer. At what point do you add the dry mix, please? I am also wondering when to add the dry ingredients. I think you omitted that from the directions. Also, I just made a very similar bread today. I found it a bit yeasy tasting. Does this recipe also taste yeasty? Thanks. I can’t wait to try this. I’m wondering if the recipe would work using silicone pans. In particular, I’m trying to create a challah-looking bread for my niece and daughter. I have a silicone pan that would help get the shape of a braided loaf. Thanks! Would other legume /bean brings work, other than color? ;) I have aduki on hand? Thanks for awesome info to improve our lives!!! I was also able to reserve and freeze an extra 1/4 cup of the brine for next time. There wasn’t quite enough for three loaves in one can. We don’t usually do canned foods any longer, so will plan to freeze the soaking water mentioned in another comment when I soak something the next time. Thank you so much for your kind heart and sharing your hard earned advice and wisdom! You make this whole journey so much less overwhelming! Hi Erika, your pictures inspired me to try making your vegan bread for my son who has an allergy to wheat,Eggs and dairy! I would like to clarify if I can substitute your flour,Erika’s gluten flour mix to King Arthur gluten free all purpose flour ? Also your recipe calls for a tiny amount,1/2 tsp xantham gum,can I substitute this for cornflour or leave it out. My son is three years old and really likes bread but all the ones we have tried from stores are too hard and tasteless,please help! I feel your frustration… My sons have very restricted diets and it was so difficult in the beginning to find recipes/food that actually tasted good! My boys love this bread recipe and gobble it down. It stays good on the counter in a bread bag for a couple of days and even does well in the fridge for a few days – I just warm it up for a few seconds and it’s good as new! I love King Arthur’s Gluten free flour mix… but it’s so expensive. I haven’t tried it with this recipe, but it should work. I would also suggest adding an additional 1/4 tsp of the Xanthan Gum per cup of flour since King Arthur’s blend doesn’t have any. (That would be an additional 3/4 tsp for one loaf) PLUS, the additional scant 1/4 – 1/2 teaspoon for this recipe. Unfortunately Corn Flour won’t work as a substitute for Xanthan Gum, but you can get it online at Amazon.com. One bag last a very long time – even longer if you store it in the fridge. Erika, what about guar gum? Xanthan gum is often made from corn and we can’t have that. If I put guar gum in place of the xanthan gum for the flour AND additional xanthan gum, do you think that would work out alright? I tried making your bread using King Arthur’s Gluten free Multi purpose flour and followed your recipe .. I would say taste wise the bread is good and my son really enjoyed eating it with some butter (vegan)and jelly, however the texture was a little hard/crusty on the outside and a little squidgy or sticky especially at the bottom of the loaf, I would have liked it to be lighter and fluffier. I was thinking could it had been the extra xantham gum added to the flour(as you recommended) or should I have kneaded the dough a lot prior to the rising stage,or could it simply have been an error in baking it not long enough? The loaf was also heavy,your one looks lighter and softer! I took some pictures but am unsure how to send them. Nevertheless, I will keep trying to perfect it but next time I will use your recipe for the flour mix. What do you think I could do to improve my bread next time? Hi Erica, can you tell me the amount of carbs and calories per slice the bread has? My husband is diabetic and we are trying to find bread recipis. Hello Erika! 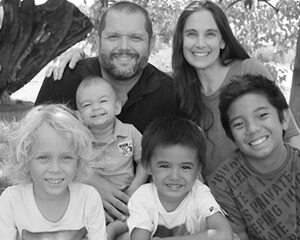 I just found your site today after visiting out naturopath with a directive to use only white rice options for my egg- and dairy-allergy 4-year-old. I’m curious as to if I can substitute your flour mixture with white rice flour only. I’m hesitant to make any substitutions because it seems like these kinds of recipes are very ingredient specific. Plus, it would be costly to invest in all of the ingredients required if I’m not able to use them going forward. Any assistance you can provide would be greatly appreciated!! Thanks for sharing your recipes! Blessings! My mom is allergic to brown rice (but not white) and we found millet flour to be a great substitute. The bread was wonderful, and is the first she’s been able to have with her allergy restrictions. My mom has an allergy to brown rice (but white is okay) so we substituted millet flour in place of the brown rice flour. This worked for us! I have not used any substitutions, the only brand that may be different is that I used the gluten free yeast packets instead of the Bobs red mill yeast. Sometimes I think my dough looks a bit thicker than your does in the pictures. My dough doesn’t collapse or sink, and the bread tastes good, it just stays dense instead of light and fluffy and it doesn’t rise. I have tried proofing it for the 20-30 and tried a little longer. If I get any type of rise it’s very little. Do you think it’s the loaf pan I am using? Also I just wanted to clarify its only 1/4 of the garbanzo bean brine and not all the liquid form the can right? My dough may be just a tad bit thicker than yours…. Thank you for your help! Hopefully you figured this out already but the climate could be the factor. Erika said she has a tropical climate. Having lived in the Tropics for a few years and in other areas I can confidently report that yeast raises SOOO much faster in those warm climates. I would suggest putting your loaf to rise in a warmer place…. inside the oven with a pilot light keeping it warm, under a hot lamp shining directly on the loaf, outside covered in direct sunlight…. wherever you get some extra heat on that loaf. I haven’t had bread in 5 yrs. because of my allergies. I keep trying new ones I find online, but none work yet. I’m allergic to chickpeas as well as all dairy,, egg, gluten, soy, etc. What can I substitute for the chickpea brine then? hank you. Thank you Erika. I’ve never tried them. Do you think adzuki beans would work? Thanks. I would try 1/4 a banana that is darkened mixed with water to make the 1/4 cup mix. Thank you Abdullah. Unfortunately, I’m even more allergic to banana. I have tried Egg Replacer but had no success. I will keep working on a replacement. Thank you anyway for your suggestion. Any suggestions for baking at altitude? I prepared my dough as described. My yeast proofed nicely, my bean brine whipped to nice peaks, but my “wet” dough was more the consistency of biscuit than cake batter. It doubled in size in about 45 min, but did not rise any more after putting it in the oven. Baked for 55 min – nice browning, but bread was mildly “gummy” when cool. Tastes wonderful, but would be difficult to make a sandwich on such “short” pieces of bread – they look like 1/2 slices of traditional bread! Thanks to anyone who can offer suggestions for improvement. I forgot to add that I live at 7500 ft, which usually requires some tweaking of baking instructions. I started measuring the “flour” carefully by first sifting and then carefully spooning into the measuring cup, followed by leveling with a flat utensil. This is a lot less flour than “scooping” with the measuring cup. My batter was much better. I am so excited to find a recipe that does not include gluten, dairy, or eggs! I put my dough to rise about an hour ago but it didn’t rose much. Any ideas? Hello Erika, I have attempted this recipe 3 times, and each time, I am very careful to not over mix, using slow and low speeds, I get the aquafaba just right, and the yeast is very activated. Each time, my dough turns out more like a dough than a cake batter, like in your photos. And, it doesn’t rise nearly as much as yours. When it bakes, it never rises at all. Any idea what I could be doing wrong? Try sifting the flour and then carefully spooning it into the measuring cup. I had better success this way. Good morning Erika how are you? I haven’t had luck with this recipe, at the end I don’t get the right texture it feels like I need a lot more water any advice? Thanks for all your hard work I really like all your recipes. Try sifting the flour and then carefully spooning it into the measuring cup. Level by scraping a flat edge across the top. I’m excited to try this. We are doing a dairy, gluten, and egg elimination for my daughter. I don’t have a kitchen aid. Do you think I could mix this in the vitamix? Hi Erika – can I make this recipe in a bread machine? 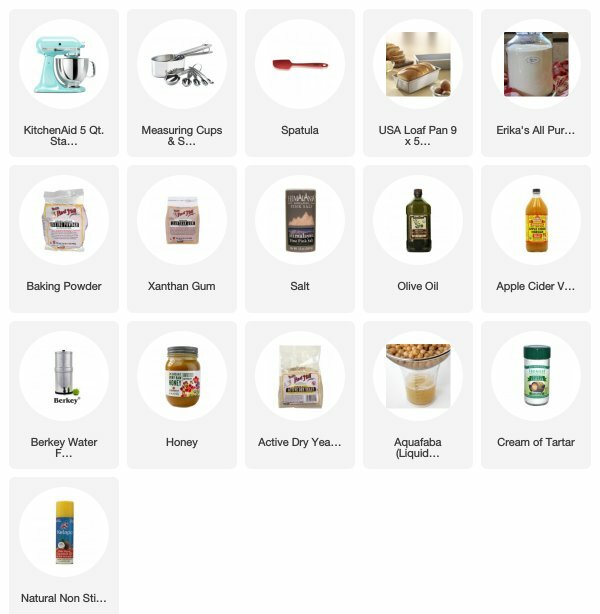 My son has multiple allergies and is now also on a wheat-free trial, so I’m keen to try it but with so much cooking already having to be done it would be so much easier if I could just add all the ingredients to my machine and let it do the work for me! Thanks. I have the same question. Will the bread machine ruin it considering it is all pre-set…? My husband tried it with the bread maker but it didn’t mix up well enough. It was tacky, like a sticky sponge. And there were significant clumps of unmixed flour at the bottom. Thank you so much for sharing this. I’ve tried many egg substitutes, this will be a new one to try. I’ve just put the mixture in the oven. I’ve triple checked my ingredients because when I mix the flour with the yeast, my batter is dry and crumbly. In the end I added water little by little until my dough looks a little wetter like your photos. I am not sure how the bread will turn out. I have no idea what has gone wrong. Was adding water the right thing to do? This is my first experience baking bread. Thanks again. Hi Erika! I’ve been looking for a GF bread recipe since I’m allergic to eggs, so was very happy when I found this, till I read the ingredients list. I can’t have any vinegars at all, my daughter can’t have cream of tartar or garbanzo beans, and neither of us can have navy beans. What can I do? Please tell me I’m not doomed to a bread-less life! May I ask you how you sliced it ? This is the first sandwich bread I’ve made from scratch that actually lives up to my expectations! It is so yummy and moist. I love, love, love it. Plus it’s cheaper than buying it from the store. Thank you so much for making the recipe. I am nearly in tears at the hope of BREAD! thank you. Im new to gluten free and have tried this recipe twice. The first time I didn’t mixed it well, and it was more a dough than a batter. The second time, I followed everything with the mixer, but I think I overproof it because it went a lil bit over the top so when i baked it it sunk a lot in the middle and was very gummy. Can you tell me any ideas of how i can improve this? I make regular bread every week but I realize im not experienced in the gluten free.. Thanks!! I’ve been making your AP gluten-free flour mix and baking your recipes for several months now. Your gluten-free bread recipe is my favorite. I am going vegan so I am going to try this one now! My question is can I use this recipe also to make gluten-free hamburger(veggie burger) buns? I have made it in a 9×13 inch pan like you say to and then cutting into square buns but I’d like to make them where you make a log cut it into 6 pieces then shape each into a ball to make individual round buns. Will that work with this dough? TIA! I would love to try this. At the moment I too stick to flatbreads, making a loaf would be lovely…however I am highly intolerant to chickpea…is there any substitute for this? Hi, I’ve tried the recipe twice now but I’m finding the mixture thick, dry and doughy – not the wet runny cake mix you describe. Feels like too many dry ingredients not enough wet – help! Sift flour first and then carefully spoon into measuring cup. Level by scraping a flat utensil across the top. Any way to make this in a bread maker??? Thanks! We made it with a flour mixture consisting of tapioca, oat, and coconut. Taste it amazing just too wet in the middle after baking. Not sure how to fix that. Bake longer? We did a full 60 mins. Browned nicely, but just a bit wet in the middle. I made this last night and I’m in LOVE!! I’ve already raved about it on facebook. Been gluten free for 4 years now and only recently vegan, this is better than ANY of the previous bread recipes I’ve made, my partner was blown away too. Thank you so much!! Help! I totally failed on my first attempt and I don’t know why. Can you help? I thought I followed all the directions but the loaf hardly rose, it turned out soggy in the middle and it was brown all the way through not white. Also, while I was preparing it it was too dry so I had to add an additional cup of water to get it to the right consistency. Any idea what I did wrong? I have some pictures I could share if that would help. Would love to try your gf vegan bread for an aunt of ours but she isn’t able to use oils. Would you know of a suitable replacement that would work? Hi, I’m doing an elimination diet from gluten, dairy, soy. Can I substitute the flour for one that doesn’t contain xanthan gum? Also what do I substitute the extra xanthan gum used? Hi Erika, could i make this bread from start to finish in a bread machine? If so are you able to suggest the steps to take to do it this way? I’m not an experienced bread maker, machine or no machine so i’d really appreciate any help, thanx in advance! Just made this bread tonight in the bread machine. I put the wet ingredients in the bottom, then the whipped aquafaba and cream of tarter, then the dry ingredients on top. I put the yeast on the very top. I used the gluten free setting on my Cuisinart bread maker set at a 2 lb loaf on light crust. The texture was quite nice, but it was just a touch sticky. I think I’ll try it again on a darker crust so it will cook just a little longer. Overall, definitely a success and I’ve made a lot of gluten free, egg free, dairy free bread in and out of the bread machine. Thanks! O cool, was so hoping i was going to get an answer here, i really wanted to try this bread in the machine, thanx! I don’t think the rise was as high as she got doing it manually, but I’m ok with that for the ease of the bread machine. I think its the Cuisinart CBK-200. I’ve made it a few more times. It did better on the dark crust setting. Due to my son’s food allergies, making my own bread is my only option. To make it as simple as possible, I tried it without whipping the aquafaba and had success! I did add it to the cream of tarter and whisked by hand for about 1 minute (not even close to stiff peaks – maybe just some bubbles!) and added it to the wet ingredients in the bottom of the bread maker. It was still great. Also, the flour mixture seems to be fairly forgiving. I didn’t have enough of you exact suggested blend and so added a few odds and ends of other gluten free flours (sorghum, etc) to get to 3 cups and it still turned out great. Also, it would be helpful if you would link your flour mix in this recipe. I always have to go back to your search box to find it, leave this recipe to mix my flour and then come back to the bread recipe. A quick link would help. Thanks for this recipe! This aquafaba has made SUCH a difference in our allergy-friendly cooking/baking. We just made your bread recipe today in a silicone pan. It turned out fabulous! I was able to slice thinly. I could have easily made a second batch today with the way that it went. I had to cut the kids off of thirds so that we could have sandwiches tomorrow. It does have a nice crust on the outside and it is moist on the inside. Also, I should note that we used maple syrup for the sweetener. Thank you so very much for this AMAZING bread recipe! It is the absolute best I have ever had. I will be replacing my 12 and 17-year-old sons bread with this better “for us bread”. I didn’t have the full 3 cups of flour so I used what I had and cut the amounts of the other ingredients appropriately. Couldn’t wait! This is the best bread recipe I’ve ever tried! My son just ate a slice – and then another and another – I can see that I’m going to have to tripple the recipe tomorrow. This loaf is nearly gone already. Thanks so much for sharing. I’m on a low carb diet and am wondering if you could substitute almond flour or coconut flour instead? Thank you! This looks amazing, but I don’t have a standing mixer. Do you think I can still pull it off? I am most concerned about whipping the garbanzo water, is there a good substitution for this? I only have a very small mixer that you hold in your hand. Thanks for any ideas you all have. I don’t eat eggs or dairy either so making breads and pastry feels almost impossible. Hi Erica, I still have to try your recipe. One query that I have is that instead of canned Chickpea, can I used water from overnight soaked Chickpea at home? If not then what substitute can I use? Combine the water and flaxseeds in a saucepan. Bring to a boil, turn down heat, and simmer for about 20 minutes until it is thick and gloppy looking. Strain through a sieve. You should have about ½ cup. Allow to cool completely. This can be stored in the refrigerator for one week. Someone also mentioned (in a forum, with that link) that it works well to also add a pinch of cream of tartar while whipping. It helps it to form stiff peaks. Oh, I forgot to mention, you’d have to change the measurements, obviously. So make it so you end up with 1/4 cup of flax goo for this recipe. Is the picture of the bread the same bread you made vegan and gluten free? is this really possible? is this some kind of trick? I’ve made this recipe twice now; both times the taste was great, but it barely raised at all. Any suggestions for what I might be doing wrong?? I proofed the yeast and it looked fine. Does the garbanzo liquid have to be fresh out of the can for it to work? Would adding flax to the aquafaba help me? I will try this recipe soon with maple or agave. I’ve made this one twice and about to make it again today. Seriously – YUM! It almost has a crumpet light texture to it and is absolutely amazing toasted with some (vegan) butter and golden syrup drizzled but is also fantastic by itself or dipped in a chunky stew. This is my bread recipe for life, there is not point looking elsewhere. Thanks so much Erika, you truly are a GENIUS! My wife has just been diagnosed with gluten, wheat. egg and bean allergies. Is there something that I could use to make this bread that doesn’t use chickpeas or beans? She loves bread, so we’re looking for anything that we can use. Could you provide alternate instructions for those of us who don’t have a stand mixer? I am used to kneading by hand and I’m not sure how a paddle attachment would correspond to mixing by hand. I just found your recipe. Ive never heard of using the bean liquid- game changer! I cant wait to try!! I love this bread recipe and make it every week for my son. I use Bob’s All Purpose since my son is also allergic to rice. Sigh. Anyway I always get a good rise and well-cooked tasty loaf. However it always sinks a bit in the middle. I would love to have the high arc you get with your loaves! What am I missing? Thank you so much for this recipe. It has been a life saver! Hi Erika! I love how the bread tastes, but It’s giving me a hard time because it sinks in the middle. I wonder what I am doing wrong. Can you help me? I just made this. Im impressed! I forgot to add the extra xanthan gum and it still turned out great. I used white bean brine instead of the chickpea brine. Thank you! Wondering if you’ve ever tried makibg this recipe in a braed machine?? I needed a good rip and dip bread for. Communion bread- this was it!!!! I hadn’t tried the recipe ahead of time I only had a Lilith loaf I made with the rest to try- but it turned out SO WELL. When the broke it- it looked just like regular bread no sandy dry crumbs. It was great! Thanks!!!! This is a total novice question, I’m sure, but is the honey necessary? We’re sugar free (among other “frees”), meaning no sugar, honey, molasses, or other sweetener except Xylitol and Stevia, both of which taste gross to me. I made this and loved it – thanks so much! I used a Magimix food processor to mix the dough as I don’t have a hand mixer with the right attachments and it worked fine. Keen to try a bread machine now so I can do it more easily, too. Hi Erika.I’m a gluten free vegan(as if that wasn’t tough already!) add to that,I can’t tolerate gums! It really is the worst thing that could happen to me LOL Would psyllium husk powder work in this recipe and your flour blend instead of the xanthan? Thank you! Hi there! My son recently got diagnosed with gluten, diary, egg, and nut allergies. I’ve been looking for a good sandwich bread recipe and this seems like a great option! I really need one I can use my bread maker for though. Can I use this recipe for the bread machine? What order should I add the ingredients in? Thanks!! I haven’t tried this yet, but rest assured I’m going to. Couple questions, do you think you could use this to make flatbread? And do you think (if you had small enough pans) that you could use this to make bread bowls? Try sifting the flour first and then gently spooning it into the measuring cup, leveling it off by scraping a flat-edged utensil across the top. This is quite a bit less flour than regular “scooping” and made a big difference for me. Hi I can’t wait to try this bread recipe. 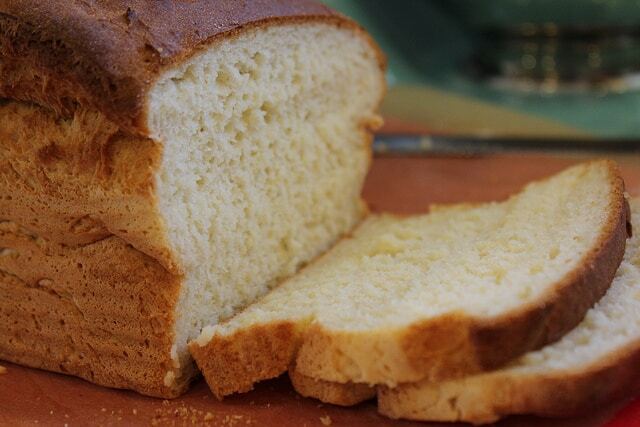 I make Gluten free bread each weekend in my bread machine. Can I use my bread machine for this recipe? Thank you for putting this together. Just tried making the bread with zing (stevia sweetener). I used to make the King Arthur GF bread, but I’m trying to be vegan (and no sweeteners except natural sweetness) too, so no dairy and this is perfect. I think it worked! I was wondering how many slices are considered in one loaf for your nutritional facts? At home today due to snow! decided to make some gluten free bread as i definitely can’t tolerate gluten in bread(my legs and face swell up alarmingly). Im not vegan but all recipes called for eggs and milk ,no eggs or milk and can’t get to shops because of snow. So i found this recipe and thought why not? luckily i had all the ingredients in. Absolutely delicious bread and such an easy recipe to follow- Thanks for the pictures too! feel really happy now i have a good bread substitute! Thank you! Hi, I just thought I’d say how great this recipe is. I had some chickpea liquid left from making a curry and searched for a vegan gluten free bread recipe and up popped your site. The recipe was so simple and easy even if it does take a bit of time it’s worth it. I wanted to let you know that my loaf didn’t sink like you say. I didn’t let it prove too long and made sure it didn’t rise too much before putting it in the oven. When it was almost cooked I left it in the oven to cool slowly with the oven off. Then when the tray was warm but cool enough to touch I got it out and cooled the loaf on its side on a wire rack. (It seems to cool better this way and not leave the bottom heavy and dense) the loaf was a success. perfectly risen, without any sinking, nicely browned and light and fluffy texture like an English crumpet when toasted! Will definitely be using your recipe again!! Thank you! I took a photo but can’t attach it here. Hello Ethical vegan!! I think you’ll find that this recipe has noted in its recipe how it CAN be made vegan!!! And if you just adapt it you’ll find it actually turns out pretty dam good!! There are no eggs, dairy or animal products if you just do what it says in the recipe and use natural sugars instead of honey! !! Has anyone tried this recipe in a bread machine? I have one with the gluten green setting.,. Thank you so much for this recipe! Im new to this gluten free baking, a seasoned wheat home baker though! was thinking of giving up on bread if this recipe was a flop! I have a gluten and soy free toddler and my partner also cannot tolerate eggs. I live in Australia and I couldn’t source the sweet rice flour subbed it cup for cup 1 cup sweet rice flour for 1/2 cup brown rice flour, 1/4 cup potato flour and 1/4 cup arrowroot and this seemed to work really well. I can’t wait for my little girl to wake up tomorrow to a yummy piece of toast, thank you again! Absolutely love this recipe! Made this yesterday and it’s amazing! My friend ate it all! Thanks for doing all of this. I’ve tried your bread recipe twice now and it isn’t batter-like but VERY heavy, like regular bread dough. (I even used your GF flour blend as recommended). I’m wondering, since I’m above 3000′ would that cause it to be less wet?? I had to JH home-ec instructions. Sift flour and then carefully spoon into measuring cup, leveling by scraping across the top with a flat-edged utensil. This really helped. oh my goodness I just made this bread!! It came out so good!!! I thank you so much for this recipe my daughter thanks you too!!!! she was so excited!!! 3-does the recipe multiply well (as in making 3 or 4 loaves at a time)? Thanks so much in advance! I would LOVE to be able to do this for the folks I know who are gluten free and/or vegan! You can freeze it. you need to “thaw” in microwave until it’s hot and steamy (re-cook?). I assume the oven would work. It goes from crumbly to soft and stretchy like a miracle. 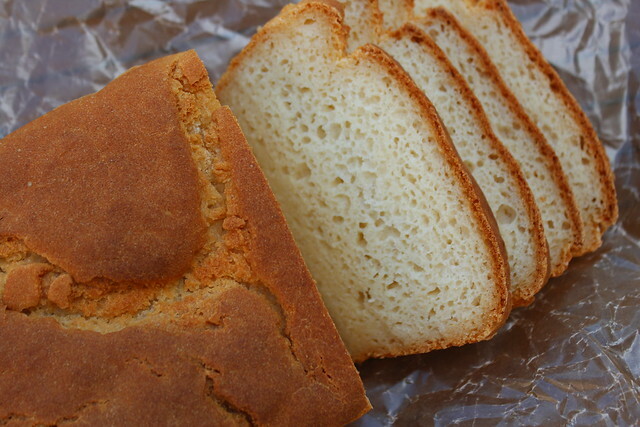 Are there instructions for making this bread at high altitude? I know there are formulas for converting recipes but I don’t want to mess this up again. I made a loaf last night and everything was beautiful until I baked it. It never reached temp in the center (only went up to 200 degrees) and it was still moist on the inside and really dark not he outside. I know you have to reduce liquids and increase temperature Help! Hi! So I made this a few times now. With your flour blend as well! And each time there’s an air pocket tunnel running horizontal in the loaf. I tried proofing less the second time, and still happens. I would love to know if you’ve had this happen in the past and how to fix it! Would love to get this recipe down! Otherwise it’s great. Happy Monday! This is the best bread I have ever had!!!!! OMG! Thank you, thank you, thank you! I can’t eat wheat (Gluten is fine. I’m actually allergic to the wheat grain) and neither I or my husband can have eggs (also allergic) and I’ve been scouring the stores and internet to find a bread that actually felt and tasted like bread. This recipe is THE BEST I’ve ever had. Thank you so much. The bread is moist, springy (like it has gluten in it), and the taste is great. Thank you so much for making this recipe available! I’ve been suffering with crumbly, dry, hard, gross tasting store-bought vegan bread. Never again. This wasn’t hard to make and your all-purpose flour is fantastic. Thanks again! Hi! Just curious if I use instant yeast instead of dry active? What adjustments do I need to do if I use instant? Erika, Luv your recipe! I tried to changing flour used and used 1 cup sorghum flour, 1 cup gluten free all purpose flour, and 1 cup garbanzo flour and all the rest of recipe unchanged except I added 1/2 tsp. xanthum gum. Baked for about 60 minutes and it was perfect bread! Thank you SOOO MUCH! I recently went gluten free due to intolerance and missed bread a ton. This was perfect! I used King Arthur gluten free measure for measure flour and it turned out just fine. Thanks again! 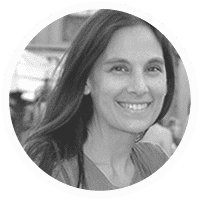 I have recently found that I am gluten intolerant, and that I have to manage that alongside my dairy and eggs intolerances. I have had so much trouble finding gluten free bread at the store without eggs or dairy, so I was so excited to find this. My loaf came out quite moist, and almost a little bit sticky. Is that normal, or is there something you’d recommend to fix it? Maybe baking it longer or perhaps I used a bit too much oil? I love this bread, and so does my son! My son has Eosinophilic Esophagitis from food allergies. He literally wouldn’t eat more than a mouse, until we saw a gi dr and allergist, and realized he is allergic to eggs, milk, wheat and soy. These foods cause inflammation and ulcers in his esophagus and stomach. This recipie is a godsend, he loves it, and it is ok for him as it has no allergins! We have tried so many recipies, and this is our favorite, by a landslide! Can I use Bob’s Red Mill 1-1 Baking Flour in place of your all purpose? Is it possible to make this in a bread maker? if so, how? I am so thankful for this awesome recipe! My little girls are on an elimination diet and can’t have gluetn, eggs, dairy, corn, etc. This has been a life-saver and I’m making it 6 loaves at a time! I just made this ( using King Arthur Gluten free flour +extra Xanthan gum) and although the loaf is short , it moght honestly have the best texure of any home made bread Ive made ( vegan and gluten free or not) This will cerainly be sonething I make on a regular basis! I just made this ( using King Arthur Gluten free flour +extra Xanthan gum) and although the loaf is short , it might honestly have the best texure of any home made bread Ive made ( vegan and gluten free or not) This will cerainly be something I make on a regular basis! My Grandson is not dairy free, only egg and gluten free, can I use 2% Milk in the recipe? I have a food allergy to rice, is there an alternative to the flour mix you are recommending? Absolutely awesome! Great taste. Best recipe so far. I had to think back to my junior high home-ec class. Sift the flour first and then spoon carefully into the measuring cup. Level off by scraping across with a flat edged utensil. Things were much better. This quite and exact science. Once I got the most amazing bread imaginable, but usually I get something a bit sticky. I have been trying to find a good recipe that’s vegan and gluten free, for 3 years, and your bread looks amazing. Is it possible to use a bread maker? I so want to try this recipe and I was wondering what would be a good substitute for a cream of tartar? I have left out the cream of tartar and it works fine. 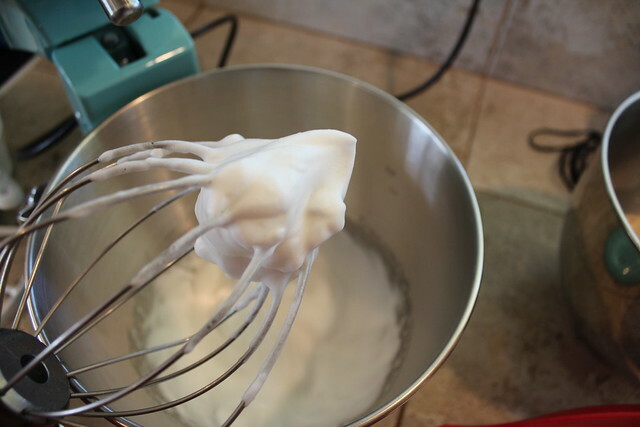 Aquafaba whips up to soft peaks. (I mix by hand. ) ALSO, YOU CAN FREEZE AND THAW IN THE MICROWAVE UNTIL HOT AND STEAMY. SOFT STRETCHINESS IS RESTORED! All I can say is Xanthan Gum is weird stuff. Love This Bread! Hi can I sub the gluten free flour mix with just almond flour and add more xythan gum? My friend can’t have corn, rice, oats etc.,, and I wanted to try to make her some bread that she can eat. Let me know your thoughts. I just made this for the first time. I had to adjust it a bit because we live at a higher altitude, but it turned out pretty darn well. I wish I could attach the pictures, but, oh well. Thanks for your help. Making the changes from gluten to gluten free is expensive and making my own GF bread will help. Next step is the banana bread. Hi, I made a gluten free and vegan cake (with aquafaba) using a recipe on your site a few weeks ago. However, I misplaced the recipe and I now can’t seem to find it anywhere on your site. Would it be possible to get the recipe again? I would like to make it for my daughter’s 1st birthday this Sunday. Thank you very much in advance.